People in Wilmington are wondering whether it’s safe to drink the water coming out of their taps. And it’s a good question. The problem is a potentially hazardous chemical called GenX – which residents of Wilmington recently learned the DuPont-Chemours plant near Fayetteville has been dumping into the Cape Fear River for 37 years. The NC Department of Environmental Quality (DEQ), which has a budget of $228 million a year, has the mission of protecting our environment from just this type of problem. How did it miss the GenX threat? That, too, is a good question. But politics, immediately, got in the way. One Democratic group, pointing fingers at Republicans, said DEQ did nothing because Republicans had stripped away its authority to do anything. Now, in fact, that’s not quite so. Six years ago the Republican General Assembly gave DEQ the legal power to regulate or prohibit industrial dumping of hazardous chemicals that create “a serious and unforeseen threat to the public health, safety, or welfare.” (Modification of G.S. 150B-19.3 in Session Law 2011-398). Why didn’t DEQ do that? We don’t know, yet. 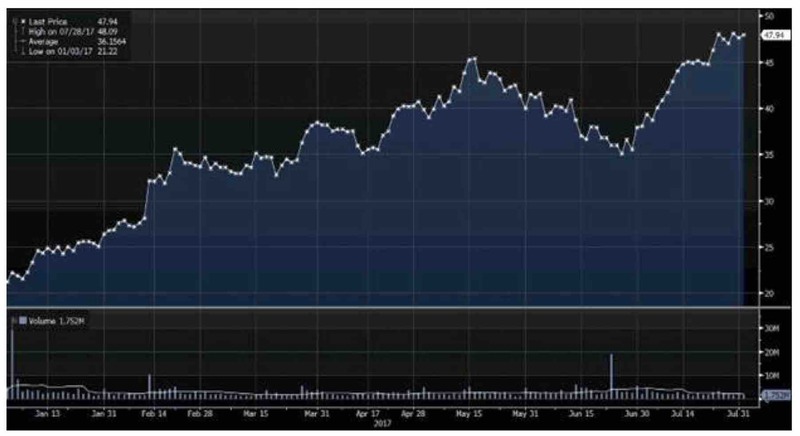 Here’s another odd fact: The stock chart below shows the price of The Chemours Company’s stock after its spin-off from DuPont in 2015 and its value today. You’d think, after what’s happened in Wilmington, the stock value would be dropping. In fact, Chemours stock hit a record high in the hours after Governor Cooper’s press conference in Wilmington about Chemours’ discharge of GenX into the Cape Fear River. Folks may be worried about GenX in southeastern North Carolina – but on Wall Street Chemours is doing just fine. How much sense does that make? DEQ and the Governor are on the front line of the fight when it comes to solving the GenX threat. But it’s not just their problem. The General Assembly has a role to play as well and that’s why we’ve been asking DEQ questions like, What went wrong? What mistakes were made? How do we avoid those mistakes happening again? Everyone should want the answers to those questions. And the sooner the better.